May 22, 2009, The United States House of Representatives today passed the FAA Reauthorization Act of 2009 which will provide the needed funding for NexGen (H.R.915). The bill will now need to go to the Senate. The present-day national airspace system ("NAS") consists of a network of en route' airways, much like an interstate highway grid in the sky, interconnected by ground-based navigation facilities that emit directional signals that aircraft use to navigate through geographic points in the airspace. Limits on the transmission distances of these signals prevent aircraft from flying direct routes on long-distance flights and limit the utilization of airspace to predefined routes where aircraft can reliably transition from one navigational signal to the next. In the terminal environment, near busy airports and metropolitan areas, aircraft follow arrival and departure routes by tracking ground-based navigational signals, much like navigation during the en route phase of flight, or by following the instructions of air traffic controllers, often referred to as receiving radar vectors. 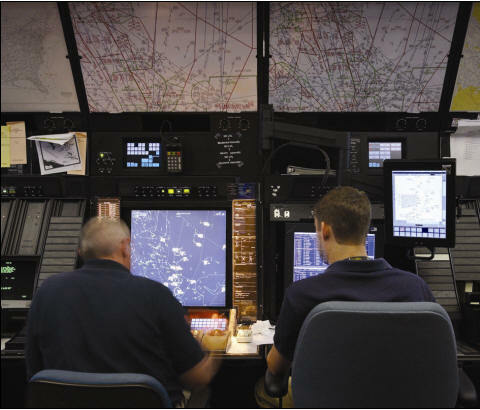 Surveillance and separation of aircraft, both en route and in terminal airspace, is largely achieved by utilizing surveillance data through an extensive network of radar sites and air traffic controllers who are directly responsible for ensuring adequate separation between aircraft receiving radar services. Maintaining this separation is achieved through extensive use of voice communications between controllers and pilots over open two-way radio frequencies. Under the current system, controller workload, radio frequency voice-communication, congestion, and the coverage and accuracy of ground-based navigational signals impose practical limitations on the capacity and throughput of aircraft in the system, particularly in busy terminal areas near major airports and around certain choke-points in the en route airway infrastructure where many flight paths converge. The NextGen plan will consist of new concepts and capabilities for air traffic management and communications, navigations, and surveillance that will involve: transitioning from a ground-based radar system to a more automated, aircraft-centered, satellite-based surveillance system; developing more direct and efficient routes through the airspace; improving aviation weather systems; developing data communications capabilities between aircraft and the ground to reduce controller and pilot workload per aircraft; and creating shared and distributed information technology architectures. Funding for NextGen will come from an increase in aviation fuel taxes; from 19.3 cents per gallon to 24.1 cents per gallon for aviation gas and from 21.8 cents per gallon to 35.9 cents per gallon jet fuel. The National Air Transportation Association (NATA), National Business Aviation Association (NBAA) and AOPA are supportive of this legislation.